how the idealistic vision of the servant as leader works even in the competitive world of business. encouraging leaders to begin by looking at what they themselves want to become and then to bring this knowledge into their daily leadership. how the principles of servant-leadership can enhance our understanding and practice of philanthropy. examining the board chairperson's especially vital role as a servant- leader. exploring what leaders learn from being followers. Larry C. Spears is president and CEO of the Robert K. Greenleaf Center for Servant-Leadership. Spears is the former managing director of the Greater Philadelphia Philosophy Consortium, a cooperative association of twelve colleges and universities in the Philadelphia area. He is the author or editor of numerous books, including On Becoming a Servant-Leader, Reflections on Leadership, and Seeker and Servant from Jossey-Bass. Michele Lawrence directs the annual international conference for the Robert K. Greenleaf Center for Servant-Leadership and acts as editor of the quarterly newsletter, The Servant-Leader. Together with Spears, she is coeditor of Focus on Leadership from John Wiley & Sons. Foreword: Why Servant-Leadership Matters (Warren Bennis). The Editors and The Greenleaf Center for Servant-Leadership. 1. Who Is the Servant-Leader? (Robert K. Greenleaf). 2. 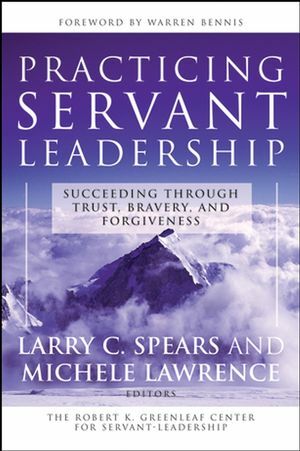 The Understanding and Practice of Servant-Leadership (Larry C. Spears). 3. The Unique Double Servant-Leadership Role of the Board Chairperson (John Carver). A Conversation with James A. Autry. 5. Servant-Leadership and Philanthropic Institutions (John C. Burkhardt, Larry C. Spears). 6. On the Right Side of History (John C. Bogle). 7. Anatomy of a Collaboration: An Act of Servant-Leadership (Wendell J.Walls). 8. Servant-Leadership Characteristics in Organizational Life (Don DeGraaf, Colin Tilley, Larry Neal). 9. Toward a Theology of Institutions (David L. Specht with Richard R. Broholm). 10. Foresight as the Central Ethic of Leadership (Daniel H. Kim). 11. Servant-Leadership, Forgiveness, and Social Justice (Shann R. Ferch). An Interview with Margaret J. Wheatley.